The magic of the movies first washed over me when I experienced Star Wars as a child, but being that I was born in 1984, the holy trilogy was delivered to my young, developing mind via a VHS tape and a small television. The magic of the theater was something I discovered the first time I realized that a film could be an event rather than just a means of entertainment after school. That a screen could be gigantic and the roaring sound could shake you to your core rather than be manipulated by a remote. I can still picture sitting in that seat and realizing that a spectacle felt so much more important when you are surrounded by hundreds of other people, all in awe of the same vision. I was nine years old and I witnessed what the definition of a "blockbuster" was. I was nine years old when I stepped onto those sticky floors and sat back in that crusty old seat. 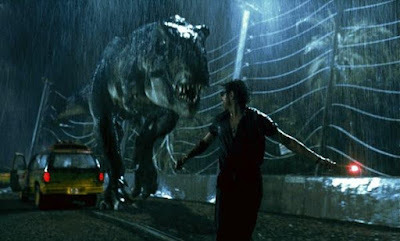 I was nine years old and I had no idea who Steven Spielberg was or why what he achieved here was so special. I just knew in my soul that it was special, and that is precisely the power of this work. You really don't need to quantify the film or break down the nuances. It's an incredible piece of art because it is, because you can see it in every frame, because it has a way of being strikingly intimate at times and yet minutes later it can overwhelm you with excitement and fear. It's like the movie surrounds you, as if you are looking it straight on and you believe you have it pegged but in reality it is just toying with you with its intelligence. It's hunting you from both sides. 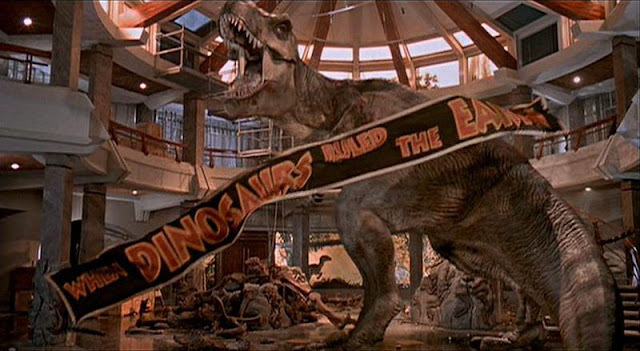 I was nine years old the first time I saw Jurassic Park, and I decided to get my child going at an even earlier age. Sparked by her excitement over the trailers for the new Jurassic World, I decided to introduce her to the dangers of Isla Nublar at the age of seven. I could see it in her eyes that she was ready, and I was right. She was constantly curious, asking meaningful questions throughout. She was constantly nervous, biting her nails and covering her eyes, literally yelling "I CAN'T LOOK!" during extremely intense scenes of peril. She was invested on both a simplistic level and also a deeper emotional level, begging the cinema gods to ensure the survival of these characters when their fates seemed dire. She was challenged in a way that no Marvel film or Disney classic has ever been able to accomplish before. She loved it. The most impressive thing to note was the impact the special effects had on her, a child born in 2007. A child who has never seen a world without a flat screen television and high definition. 22 years after its release and she couldn't comprehend how they pulled it off. She asked me if dinosaurs were real, and after explaining that they were but are no longer with us she seemed puzzled. "Okay, but they are right there with the people. So they must be real." "No, honey, those are just pretend." "No, the dinosaurs. The people are real, the dinosaurs are just visual effects. Pretend. They are just for fun, for a movie." "But....but they look so real." 22 years later and nothing about Jurassic Park looks or feels dated. It was a towering achievement then and it's even better today. It tricked my kid into believing that dinosaurs are alive right now, that she should be afraid that they could come get her at any moment. I saw the relief when I explained that it was just the magic of the movies she was seeing. I saw the wonder in her eyes when the final act was unfolding at a rapid speed. She has spent her whole life in a world designed for short attention spans, with multiple ways to stimulate her mind at her fingertips at any moment and yet for roughly two hours she couldn't look away.